I started my first round of bodybuilding in 1960, when I was 24 years old, I weighed 145 pounds at 5’9”. 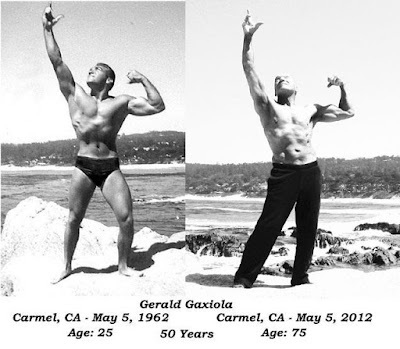 I trained for ten years stopping in 1970 when I was 34, weighing approx 190 lbs. 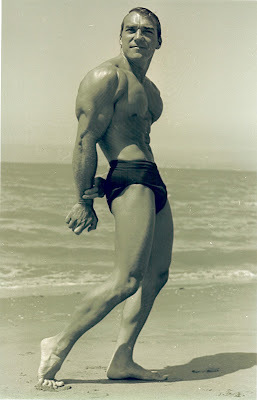 I trained at Jack Delinger’s gym in Oakland CA. - Jack was a former Mr. America and Mr. Universe. 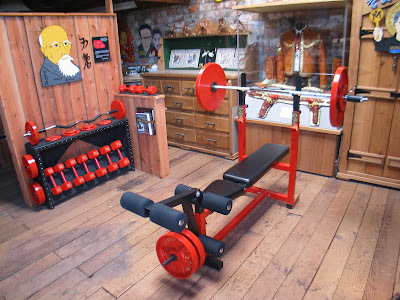 Jack's gym was a no frill gym with free weights, wooden floors, and a small portable shower in a small dressing room out back. He had a few benches and a lat machine, that was it. This was bare-bone training, back before steroids and modern gym equipment and supersized gyms. You were there to train not socialize. I was a total novice so Jack started me out with the basics: three sets of ten reps with bench press, arm curls, overhead barbell press, triceps push-downs, lateral raises, squats and calf raises. Because I was so skinny his diet plan was; “Drink a lot of milk and eat a lot of food!” That was it, no fancy nutra-talk, just train hard drink milk and eat a lot of food. So I trained hard drank a quart of milk a day and ate a lot of food. In two years I gained twenty pounds of muscle and I had my first picture in a muscle magazine. In 1964 I started training at Mitch's Albany Gym which was a more up to date gym with more equipment. I was able to expand my routine and soon I started entering weight lifting contests as a power lifter. 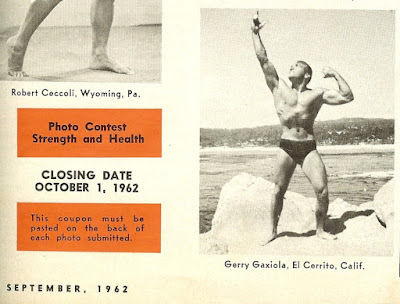 Then, in the mid sixties, I started entering bodybuilding contests. In September 1968 my photo was on the cover of Strength & Health Magazine. It was a high point in my bodybuilding career. However, in 1966 I had started art college so my attention was divided between the physical and the spiritual culminating in my quiting my job in 1969 to devote my life to art. My training trailed off until I eventually quit bodybuilding entirely in 1970. I was 24 when I started and 34 when I stopped. For the next forty years I lived the "artists life": smoking, drinking beer and wine, and eating whatever I wanted. My second round of body building, which I called my Muscle Marathon, inspired by Japan's Marathon Monks of Mt. Hiei - started in 2009 and lasted seven years - starting in March 2009 and continuing until March 2016. I was 72 when I started and I am 79 today and will be 80 in November. This time it was more about my health - both physical and spiritual. I stopped smoking, drinking beer and wine, and I now eat a strict high protein low calorie diet and drink a lot of water. 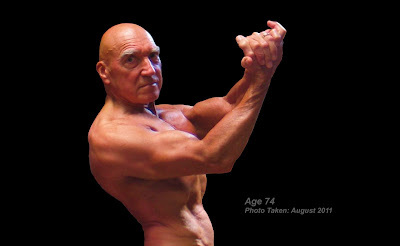 When I set a goal of seven years of strenuous bodybuilding I didn't know if I could regain any of my former size and strength at the advanced age of 72. Needless to say I was surprised that I started showing muscle gains after a little over a year of training. That encouraged me to push myself harder to the point where I regained some of my old size and shape. It wasn't easy, I suffered a lot of torn muscles and joint pain because I was using maxim weight to gain more muscles. However, for the second half of my marathon I began to train less vigorously so that I could concentrate more on the spiritual side of weight training. Most people believe that weight resistance training is only about ego - and for some it is. But for me at this age it is more about health and personal awareness. I believe that how one looks, how one acts, and how one presents one's self reflects one's innermost workings. I believe one should try to project a seamless example of spiritual and physical harmony. 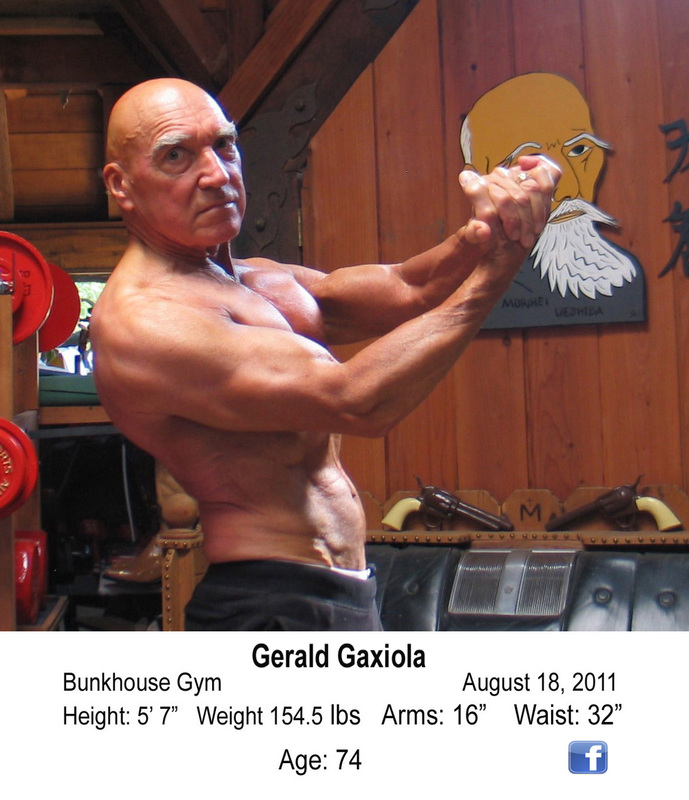 Morihei Ueshiba said, "The purpose of training is to tighten up the slack, toughen the body, and polish the spirit." 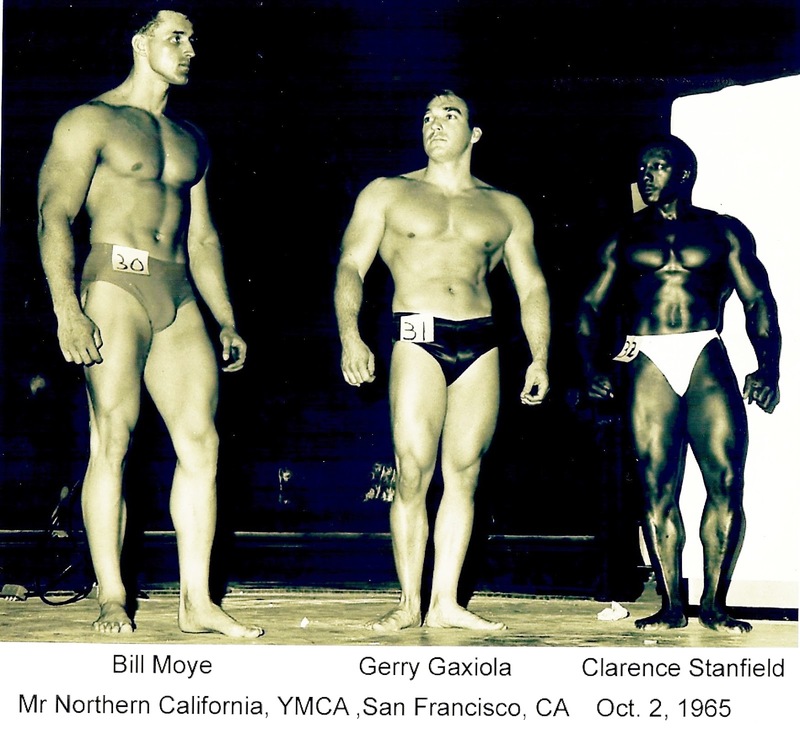 I believe the techniques used for building muscle can also be used to cultivate spiritual knowledge, virtue, and love - important things as one grows older. My plan now is to continue training into my eighties, except that it won't be strictly bodybuilding anymore. What I plan to do now is just to work a simple muscle maintenance program which will also include some Chinese Qidong. It will be training on a much less rigorous schedule: three sets of ten reps with moderate weight using the basic exercises that I learned from Jack Delinger back when I first started weightlifting. It will be on a two or three times a week schedule. My diet however will stay the same because it works so well. I weigh in at 160 -163 lbs and I'm holding steady at that weight. My hope is that with this muscle maintenance program I will to continue the balance I now have between the physical and the spiritual - which is something I wanted to do when I started my Muscle Marathon. I will end my marathon by saying that your body is the most valuable thing you own. All the money in the world cannot buy you a new one. It is imperative that you strengthen and preserve, for as long as you can, the only one you will ever have. Eat well, exercise, and try to live in harmony with the universe. I wish everyone good luck, good health and may you all have long and healthy lives. These twelve binders contain a seven year record of my food consumption with daily photos, calorie and protein amounts consumed, and a record of my body weight (taken twice daily). My dinners varied so I took photos of all my dinners. I also took photos of any breakfast and lunch variances that occurred when I traveled. These protein containers are from the protein I consumed over my seven year marathon. I consumed over 360 pounds of whey Isolate Protein plus Creatine and L-Glutamine supplements. The large white buckets contained 15 pounds of protein while the rest are mostly 5 pound containers. It’s hard to believe that I have been training six days a week for six years. 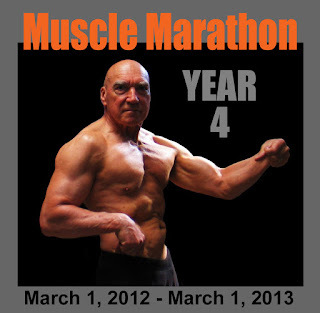 Yet here I am starting my seventh and last year of this Muscle Marathon. I started out at age 72 and I am now 78 and still training. That in itself is quite an accomplishment. Most men my age are living a sedentary life eating as much of whatever they want and doing as little as possible. I’m sorry to say that is how “retirement” is defined here is the USA. As you know if you have been following my yearly updates, I have been putting more emphasis on the spiritual side of my journey and less on the physical these past few years. However, I still train just as hard and I still use the same poundage I started using on year four for my routine. I found just enough poundage for each body part so as not to cause injury but still enough weight to keep my muscles working hard so that muscle atrophy doesn’t set in. My diet has stayed the same for year six as it was for year five. I still take my whey protein isolate with breakfast and lunch but I no longer take it with dinner. 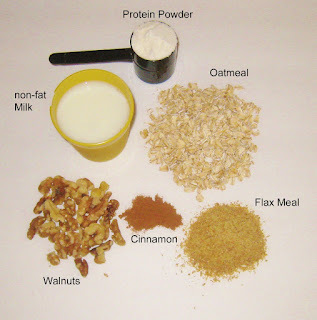 I found that 50 grams of added protein works the best for me – not too much and not too little. My body weight has stayed right around 160 pounds all year. I believe I look the same now as I did in year five with no marked difference. Since I have been putting the emphasis on the spiritual side of my marathon I decided not to take any posing photos of my physical self this year. I do have one of me on the beach on Half Moon Kay in the Bahamas when my wife and I were there on a sea cruise in April but that’s about it. I continue to do bamboo and tree blossom painting with Chinese characters added plus some small landscape paintings. So in year seven, the final year of my marathon, I will follow my doctor’s recommendation and continue training and eating as I have been doing. Be sure and check back next year, March 1, 2016, as I complete my seven year marathon and sum up the experience. My diet has changed a bit since year four as I have cut my added protein by 1/3. I now only add 25 grams of whey isolate protein to my breakfast and lunch. I have been pretty much pain free for the entire year with the exception of some minor arthritis flare-ups in my hands from time to time. As my workouts have become stabilized and my routine pretty much fixed I have been able to change my emphasis from the physical to the spiritual with the hope that at the end of my marathon I will have gained some spiritual wisdom as well as maintained some physical strength. Seeing a representation of the Buddha during my workouts keeps reminding me of the discipline and focus needed to move to the next level of self-awareness. It has also changed the way I approach my training as well inspired me to venture into a new style of painting. Bamboo painting has been very popular in China from the beginning of the Sung Dynasty (960 – 1279) to the present. Beyond form and color bamboo encompasses the virtues for which Confucius and other Chinese philosophers strived for: Bamboo is hollow (empty-hearted, standing for the virtue of humbleness). The nature of bamboo is to be straight (standing for the virtue of rectitude). Bamboo’s joints are clear-cut (like the virtue of chastity). 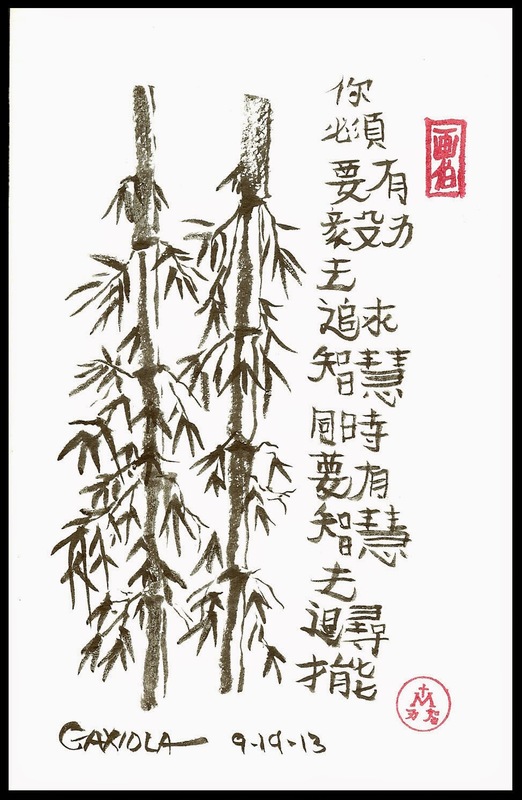 It is said that if upon seeing a bamboo painting one says there is nothing there but bamboo then one really does not understand bamboo nor does one understand the painter who painted it. In bamboo painting one can find the essence of true art. 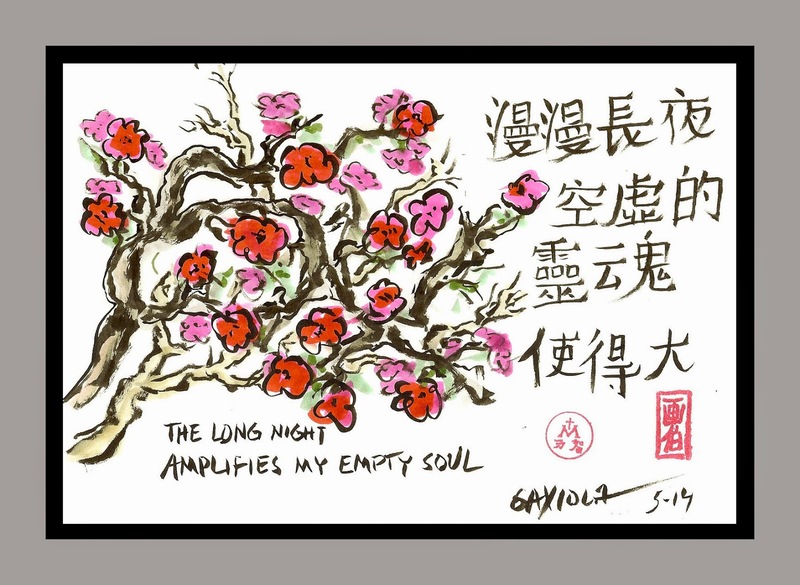 I have been practicing writing Chinese characters for some time now and although I am not at all proficient in the Chinese language I manage to get some of my poems or aphorism’s roughly translated through Google so that I can add them to my ink bamboo paintings. Like the English words that I saw on stores in China under the Chinese signs, though not always a strict word for word translation they did give me a feeling of connection. For me it is the act of painting the characters and the essential spirit within that is important not the correctness of the wording. 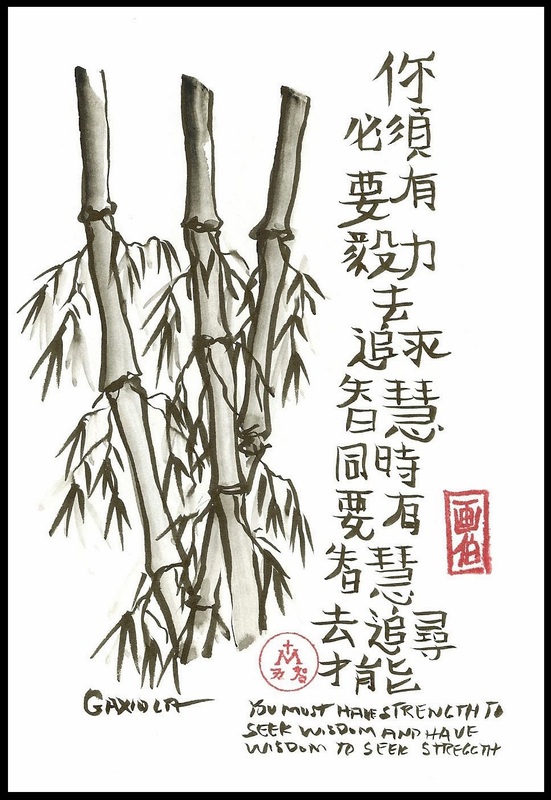 I add them to my bamboo paintings as a way of connecting myself to the spirit of Chinese master bamboo painters of the past. I am hoping to gain the spiritual lessons contained within the act of painting bamboo and doing Chinese calligraphy. I’m hoping it will strengthen my resolve to become a more spiritual artist. As I said, after four and a half years of emphasizing the physical I now want to start emphasizing the spiritual. Return here next year for year six summery to see where this spiritual/journey is taking me. Just as “spirit”, or “energy”, creates all living things in the universe, so too the human spirit creates art. As I enter the last two years of my marathon and shift my focus from the physical to the spiritual I thought a visit to Muscle Beach would be fitting at this transitional point. So in December my wife and I made a pilgrimage to Muscle Beach in Venice, CA. I have always wanted to visit this mecca of bodybuilding to see the place where all the greats of bodybuilding’s golden age trained. I saw plaques honoring the greats who have all trained there: Larry Scott, Jack Lalanne, Arnold Schwarzenegger, Bill Pearl, Don Howorth, and many more. I enjoyed my visit very much. "If you are going to be an artist be a complete one or die in the attempt"
In August of 2012 I passed the half-way point of my marathon. I have completed 208 weeks of six days a week training with 156 weeks left to go. For the past four years I have been concentrating on the physical directing all my efforts toward gaining control over the health of my body. I feel I have accomplished that. So now, after four years of intense training, I believe it is the time to ease up on the physical and begin to explore more seriously my inner spiritual self so that, at the end of my marathon, hopefully, I will have found a balance between the physical and the spiritual. In order to help with the spiritual I thought it would be a good time to go to the source of my marathon inspiration; China. 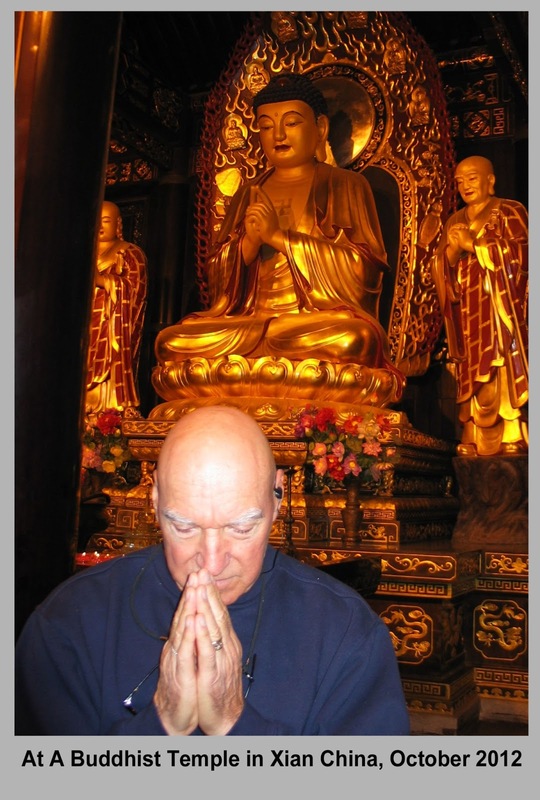 I was inspired to start my muscle marathon by China’s Shaolin Monks (along with the Marathon Monks of Japan) so I decided I should make a pilgrimage to China - a spiritual journey if you will. In October my wife and I took a two week trip to China. It was a wonderful and mind opening trip. But there is too much to talk about here in this blog up-date. If you are interested I have a detailed account of this trip to China on my web site. Go to, www.maestrogaxiola.com and click on, “China – Spiritual Journey.” There you can learn more about my trip and see photos of my interaction with China’s Buddhists Monks. I have had no trouble maintaining my bodyweight within a range of 157 -159 pounds all year. Because I have tracked my food consumption every day (calories and protein) for the past three years I pretty much know how much I can eat daily to maintain that weight and still have enough protein to build and maintain my muscles. I did however cut back on my protein intake by 25 grams because I think after four years of intense training I have made the bulk of my muscle gains and I don’t need as much protein anymore. Now my training has leveled off and is more or less just for maintenance with the possibility that I might get a little more muscle definition. I have a routine that is comfortable with just enough weight resistance to work all my muscles satisfactorily. I think the gains I have made over the past four years are proof enough that a rigorous weight training regimen with a high protein diet can result in larger muscle mass at an advanced age. More importantly it is also beneficial to one’s health; at seventy-six years of age I still take no prescription drugs of any kind. My routine is basically the same as it was last year except for a few minor changes. I felt I still needed to work on my posture so I changed my training routine a bit putting more emphases on upper back, traps, and deltoids. Unfortunately I got a little over zealous and tried a few new exercises and as a result I tore a shoulder and bicep muscle. I quickly went back to my regular routine, but I had to work with very light weight weights for a while until things healed up a bit. I still have some discomfort in my shoulder and right bicep but I am able to use full weights again. That’s the problem with old bodies they don’t allow for any variety unless you take it very very slow to start. I remember when I first tried to do dumbbell lateral raises I thought I could use 25lb dumbbells. But after a couple of days my shoulders were so damaged I could hardly lift my arms. It took months before I could do them again and when I did I had to start back using 5lb dumbbells and work my way up. My marathon is part of my artist’s life now and with it a new image has emerged. It has been a slow but deliberate image change from cowboy artist to physical/spiritual artist. It hasn’t been easy because I spent forty five years promoting and living with the “Maestro” cowboy image. But the transition is sincere and I am comfortable with things as they are now. In order to make the transition more acceptable to others I incorporated my new image into my website while still maintaining some of my old cowboy image. Most of my friends, with the exception of a few, have accepted this new image and understand the philosophy behind it. With three more years to go on my marathon I am looking forward to what may lay ahead for me physically and spiritually as I strive to become a more complete artist. Be sure and check in next year (March 1, 2014) to see how things are going. My muscling up theory is this: if calories build fat cells and protein builds muscle cells theoretically if you eat just enough calories to fulfill your body’s energy needs and eat enough protein to fulfill your body’s muscle building needs then you should end up with a lean, muscular body with a minimum amount of fat. In year three I tried to put that theory into practice and have had some success. I have gained more visible muscle in year three than year one and two combined. I seemed to have found the right balance with regards to my diet and my training regimen. I have a training routine that I am comfortable with, using poundage that works my muscles yet does not injure my joints. My diet keeps my body weight fairly stable at around 157 to 159 lbs. and my body is fairly lean and muscular . My skin is not as tight as it used to be and there is more of it around my belly because of vertebrae compression, but I definitely look more muscular now than I have since I started my marathon. Apparently muscle cells don’t stop repairing and rebuilding themselves just because your body is old, just like a car doesn’t stop working just because it is old. If all the parts are still there it will still run. However if you abuse your car and neglect to put oil in the engine for example it will stop functioning as it is supposed to. The same goes for your muscle cells. If they don’t get the stimulation and the muscle building protein they need to rebuild themselves they will deteriorate. It is important for old people to understand how important exercise and getting enough muscle building protein in their diet is. The problem I found with most old people is that they think because they are retired they have earned the right to eat as much of whatever they want - usually a lot of junk food, and do whatever they want - usually as little as possible. That combination of overeating and inactivity is the main reason old people are suffering from so many ailments, and in a lot of cases the reason they pass away before their time. Old people take in way too many calories and not nearly enough protein for their needs. That is why an ever increasing number of them have diabetes and heart problems - which requires them to take a handful of prescription drugs every day not to get healthier but just to stay alive. It doesn’t have to be that way. Diet is the most important factor in having good health when you are old. In most cases if old people would watch their diet they would lose weight and automatically be more active. That would go a long way toward resolving many of the health problems they have. Myself, I pay strict attention to my calorie consumption. I watch my body weight as well as my appearance. A simple thing like climbing on the scale every day and looking in the mirror can help anyone judge if their calorie consumption is exceeding their energy needs. If you are storing fat cells, you weigh more and look fat. Its simple as that. You need to look in the mirror and be honest with yourself. If you only look in you medicine cabinet mirror you only see your face, you need to look at your entire body to see if you are fat or not. Be honest and don’t lie to yourself. Saying your not fat when you are doesn’t fool anybody. Because I am trying to build muscle cells as well as starve my fat cells my diet is based on a foundation of whey isolate protein. Whey isolate protein is a muscle building meal with around 25 grams of muscle building protein. I have four meals of whey isolate protein a day. For breakfast I have a whey protein meal along with Oatmeal, flex meal, raisins, cinnamon, and nuts. 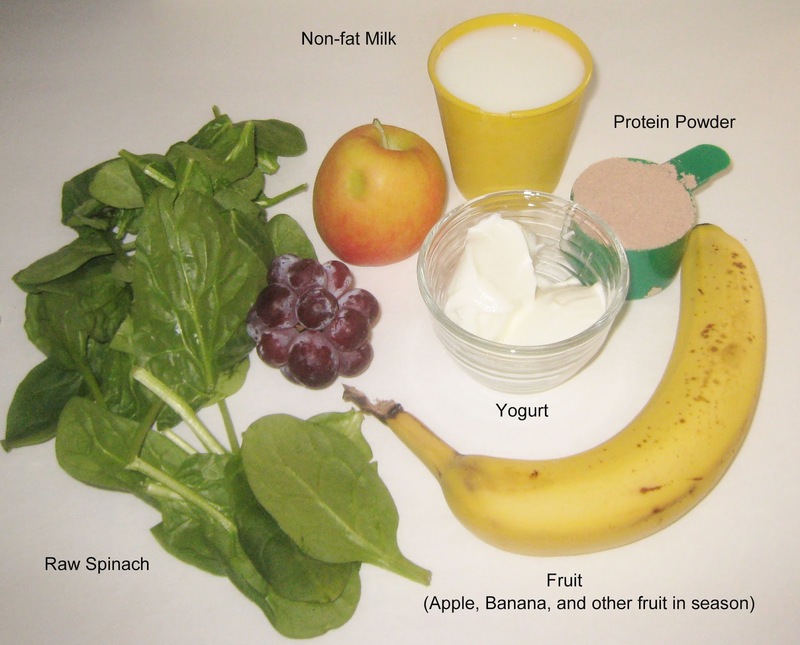 For lunch I have whey isolate protein meal with non-fat milk, yogurt and raw spinach plus a fruit plate. Since I train in the afternoon I have a protein meal after working out, then one more protein meal at eight in the evening before bedtime. Besides the calories that I get in my breakfast and lunch meals I have a calorie meal around 5 PM which is usually prepared by my wife. It almost always includes vegetables and some sort of meat. We do eat out occasionally and I do eat hamburgers and pizza from time to time but I watch my portions carefully and seldom ever consume over 600 calories with this meal. I try to find the right balance between having just enough calories to supply my body with the energy it needs but not too many so as not to store them as fat cells. I have to watch my calorie intake carefully because if I don’t get enough calories then my body will start to break down muscle cells to use for energy and I don’t want that. 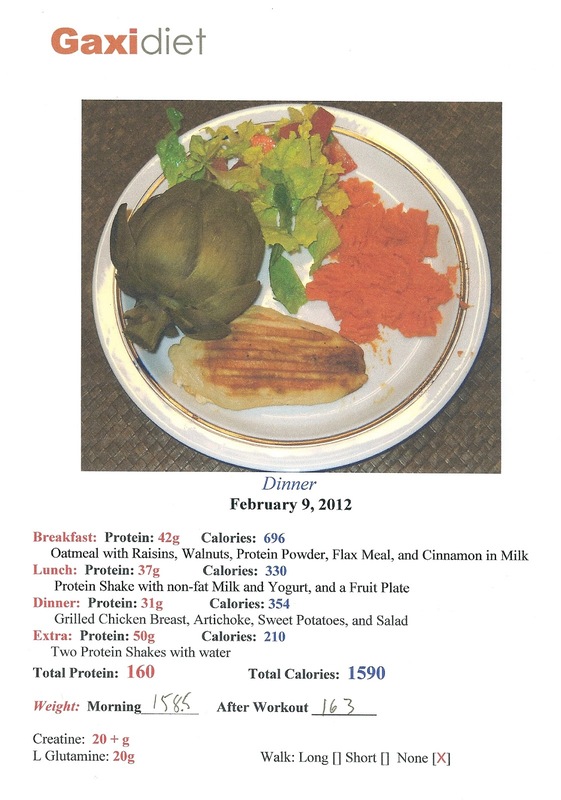 I am now trying to keep my calories under 1900 which is keeping my weight in the 157-159 lb. range. In the event my weight drops below 157 lbs. I add more calories with an egg or some walnuts, raisins, and sunflower seeds, or a slice of wheat toast with peanut butter with my evening protein meal to get my weight back up. I still take photos of my food and record what I eat each day. I weigh myself twice a day. I weigh myself first thing in the morning when my body is essentially empty, then again in the afternoon when my body is filled with food and drink. There is usually around 6 lb. difference, depending on if I have gone to the bathroom, have taken a walk, or was otherwise active beyond my workouts. 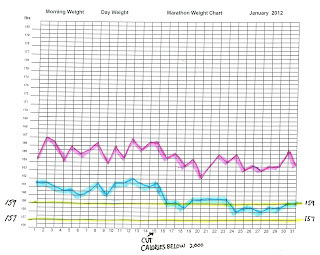 I have tracked my body weight everyday for over three years now and keep charts. On January 15, I cut my daily calorie count to below 2000. If I can stay at around 1700 that would be ideal. I want to keep my fat weight as low as possible. I am trying to keep my weight in the 157 to 159 lbs. range. If 1700 calories a day keeps my fat weight stable then the only weight I put on over the next four years should be muscle weight. In spite of what you probably heard around the gym, a lot of weight is not needed to have lean well defined muscles. When I weighed 175 my arms were a little over 16 inches and my waist was 36 inches. But after losing over 20 lbs I found I still had 16 inch arms but my waist had dropped to 32”. In other words one can lose body fat without losing muscle size. 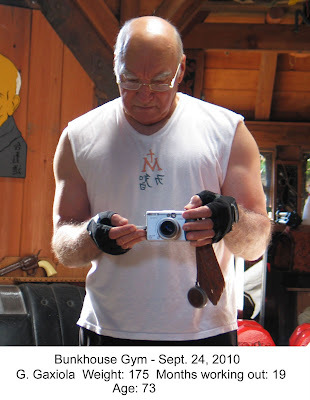 I never would have believed that fifty years ago when I was first working out. 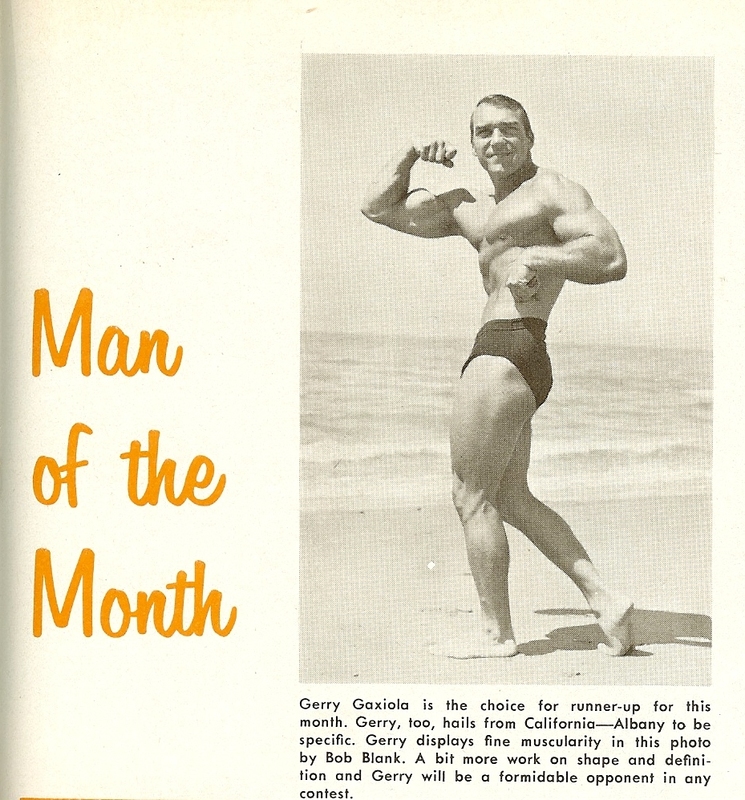 Back in the 60’s the golden rule for bodybuilders was to gain all the weight you could because without weight you couldn’t have big muscles. That was wrong then and it is wrong now. You don’t need to gain twenty pounds of body weight in order to have a pound of muscle. What you need to do is just gain a pounds worth of muscle cells. From what information I have gathered the ideal healthy body weight for a non-training 5’ 7” male, with no excess fat, is a lean 143 lbs. So if I have trimmed off all the excess fat from my body through a low calorie diet this past year it means I have gained about 14 lbs of extra muscle through weight training and my high protein diet. The question then is, if I continue doing what I’m doing how much more muscle weight can I hope to gain? 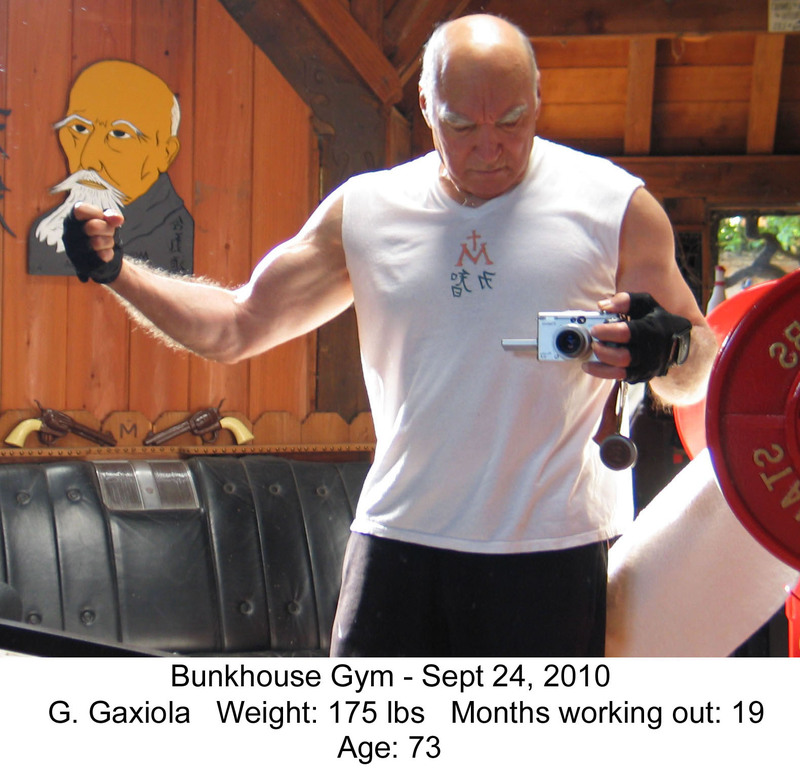 The maximum muscle gain through weight training for me, at my age, is probably around 20 -25 lbs. That means I should weigh 163 - 168 lbs when I reach maximum muscle gain. How long should that take? Typically I think it probably takes 3 to 5 years for a young man. Seeing how I am 75 years old, it could take 5 to 7 years to reach my maximum muscle growth. I think that by the end of my marathon I will have gained all the muscle I ever hope to gain. There is also the possibility that I could lose muscle size too as I age, so I’ll just have to wait and see how things develop. Out of a possible 313 workout days in year three I missed 24 days due to injuries (most of them knee injuries) or travel. I still have some shoulder pain but nothing major, just some discomfort in certain positions when I’m sleeping. My hands still suffer from arthritis and I can see that as a problem in the future. For now I am taking over the counter Ibuprofen to ease the pain. Eventually my muscles will be capable of lifting more pounds than my hands will be able to hold so I’ll have to cut back on the poundage, but I‘ll cross that bridge when I get to it. Right now I am lifting just about the maximum for muscles and hands. Overall though my joints are pretty good shape because I use only dumbbells for most all exercises. I am still precipitation drug free and, as I have said before, I do not take any kind of steroids or other human growth hormones. My bodybuilding gains are all from Whey Isolate Protein, Creatine, and L-Glutamine. My training routine changed a bit form year two as I stopped all overhead pushing motions. I also stopped doing barbell bench presses. My shoulders joints can’t take the punishment. I made adjustments in my workout schedule so that now my routine is “old body” friendly. I put extra emphasis on my arms, back and abs to help with my posture and to get that wide tapered look. This is the training routine that I used for most of the year and will continue to use (with slight adjustments if needed) in year four. My legs have always been my weak point. Back in the 60’s when I was power lifting I could bench press more than I could squat. My biggest fear now is that my legs might give out and I will become immobilized. For that reason I have been extra careful during my marathon to use lighter weights for leg exercises. I know that means less muscle gains on my thighs but since this is about health and not ego, and the fact that I am not competing anymore, it’s OK. In December my knees began hurting a bit while doing dumbbell squats. I quickly stopped all leg exercises until they were better. I began again in January but with very light weights. I am very careful now and at the first sign of joint pain I will stop again. I don’t know if strengthening the muscles around the knee joints will keep them from going bad but I am hoping the extra muscle strength will help take some of the strain off of them. I have also doubled my Glucosamine Sulfate dosage to see if that will help strengthen my joints. 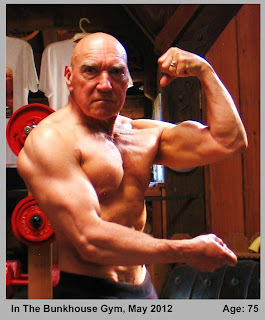 While I am very pleased with my progress so far I realize that there has to be a point where old age wins the battle and my body will no longer make gains and will finally shut down. No matter how much I train or how much protein I ingest my body will refuse to respond. I have no idea when that will be, hopefully at least twenty years from now, but all the same I accept that as a natural part of life. Right now however I see no signs of that happening as the trend continues to be toward even more gains. But more gains are not important, I will be happy just to maintain what I have for the rest of my marathon. If I am able to maintain my current level of health and fitness into my eighties I will be happy. In the meantime I want everyone to know the truth about what I’m doing, how I’m doing it and the results of my effort. There are too many people out there making all sorts of exaggerated claims about building muscles some easy way using this or that product. There is no shortcut, it takes work, discipline, and a good diet.. Anyone can be healthy and fit if they take care of business. And the best way is the natural way without taking steroids or some other drug that has the potential to kill you. You don’t have to take drugs in order to be healthy, muscular, and fit. So with that I’ll close year three and begin year four. I’ll see you here at the end of year four on March 1, 2013. In the meantime I wish you much health, love, and happiness. 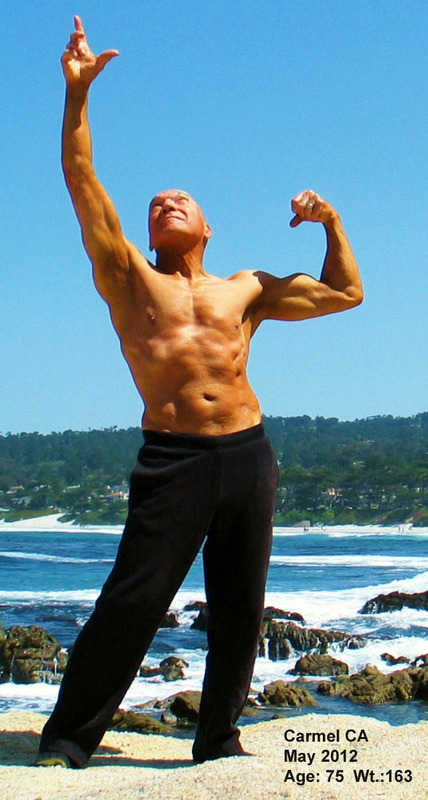 When the human body gets old and sits idle for long periods of time the body’s muscle factory (where proteins and amino acids build muscle cells) begins to shut down thereby causing the muscles to deteriorate and the body to weaken. In order to reverse this process the body’s muscle factory must be rejuvenated before the body can begin building muscle again. Giving the body the necessary foods required to build muscle cells is the first step, then the muscles must be stimulated. While some muscles may be stimulated by walking or jogging, weight resistance training is the best way to stimulate the entire muscle infrastructure so that the body will begin rehabilitating the tools necessary to facilitate muscle restoration . It is important to remember that muscle and strength building is done from the inside - not from the outside. All that can be done from the outside is to eat the proper muscle building foods and supply muscle stimulation. The inner body does all the real work by directing its muscle factory to produce more and more muscle tissue for bigger and stronger muscles. In Year One I stimulated mostly the larger muscle groups. Halfway through Year Two I began to expand my workout routine to include more muscles. My thinking was that if I stimulated all my muscles rather than just a select few my body’s natural muscle building mechanisms would be more likely to respond. I thought that by subjecting all my muscles to strenuous resistance for a sustained period of time my body would once again activate those mechanisms that do the muscle repair and rebuilding. Like an old factory that has been setting idle for years, in order to get it producing again, all the machinery within that factory has to be reactivated, not just a few selected parts. I started Year Two using my original workout routine, then about half way into it I added the extra exercises that engaged all muscle groups. I used that routine with good results until November. Then in November I got a little over confident and began pushing myself. I thought I could do even more. I worked out a routine whereby I would workout two groups of upper body muscles very hard two times a week rather than working all four muscle groups modestly three time a week. I would still work out six days a week but now I would be concentrating on chest/arms on Monday and Thursday, shoulders/back on Tuesday and Friday, legs/abs Wednesday and Saturday. This way I was able to really intensify my workouts. For example, I was doing 15 exercises for my chest and 22 exercises for my arms. However, after a couple of weeks of this intense training I began to feel as though I had been in a car wreck. My body felt like it was beaten and battered all the time. Finally after five weeks of this new routine I had to give it up because I injured my left shoulder. It was so bad I had to stop working out my upper body entirely. It took two weeks before I could start training again. My body is just too old for two-hour-a-day intense training. Needless to say I went back to my previous workout routine having found my age limitations. 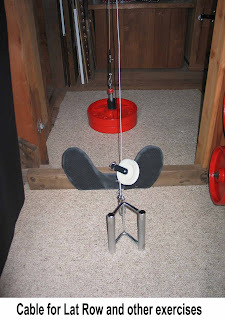 I fashioned a system of cables for lat rows, triceps pushdown, and various other exercises. For under twenty bucks I made myself a perfectly good apparatus. As I said before, there is no need to spend a lot of money on equipment, just a little creativity and a trip to Home Depot will do the trick. In Year One I had problems with my hands, my wrists, my elbows and my shoulders. Arthritis in my hands would sometimes flair up to the point where I could almost not grip the weights. It turned out to be the pineapple in my diet. For years I had been eating a fresh fruit salad for lunch that included fresh pineapple. When I eliminated the pineapple the arthritis flair ups in my hands stopped. I used wrist wraps on my wrists for most of the year and apparently my wrists have now strengthened themselves to the point where I no longer need them. The elbow pain has gone from my right arm and is almost completely gone from my left arm. I still use elbow wraps for my bench presses but otherwise I have no problem with my elbows. My shoulders are still the most venerable parts of my body. My left shoulder is still sensitive to some exercises. I have learned which exercises aggravate it and I now revamped my workout routine around those exercises. I have also had to reduce the amount of weight I use in order to keep these body parts from getting injured again. Fortunately my knees have never given me any trouble so I have had two years of continuous pain free leg training. When I see some men my age using a cane, and in some cases even a walker, I think of how fortunate I am to have started working out my legs before that happened to me. My legs are now in pretty good condition due to two years of weight training. Your life can be very restricted if you are unable to walk without assistance. Your legs give you freedom to move about at will, and when you are old that is the real definition of freedom. As I mentioned last year I keep track of all the food I eat with photos and a daily calorie and protein consumption chart. Depending on weight, gender, height, age, a person needs between 1800 and 2500 calories a day. 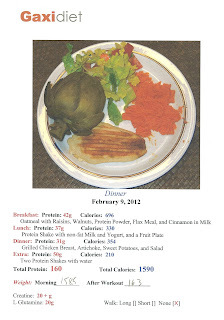 For most of Year Two my calorie count was between 2500 and 3000 calories per day. In December I decided to try to lose the remaining belly fat that I had. So for the past three months I have been on an 1600 -2000 calorie diet. I sometimes go above 2000 calories a day but for he most part I have succeeded in staying below it. Meanwhile I have increased my protein consumption from around 150 grams to around 170 grams per day or about 1 gram per pound of body weight. What I am experimenting with is the notion that I can starve my fat cells with the lower calorie count and feed my muscle cells by increasing my protein intake. I will carry this program on into Year Three. In Year Two my body weight reached a high of 179 lbs and a low of 160.5. lbs. Today as I start Year Three my body weigh is 165.5 lbs. In addition to the protein I get with my meals I continue to take whey protein isolate. Over half of my daily protein comes from whey isolate protein. I have increased the amount from 75 grams to 100 grams per day. That boosts my daily protein from all sources to around 150- 170 grams a day depending on my dinner menu. I also take the supplements Glucosamine Sulfate, Creatine, and L-Glutamine. Glucosamaine Sulfate is for cartilage and joint support. It seems to have helped. Creatine and L-Glutamine are muscle building amino acids. They are normally found in the body, however, at my age, and because of the small amount of food I eat, I am not sure my body produces enough to properly utilize the amount of protein I ingest. So I take 10 grams of each per day to be sure my body has what it needs to build strong muscles. There is a good chance I am overdoing it but I would rather my body have more protein, Creatine and Glutamine than it needs to build muscle rather than not enough. 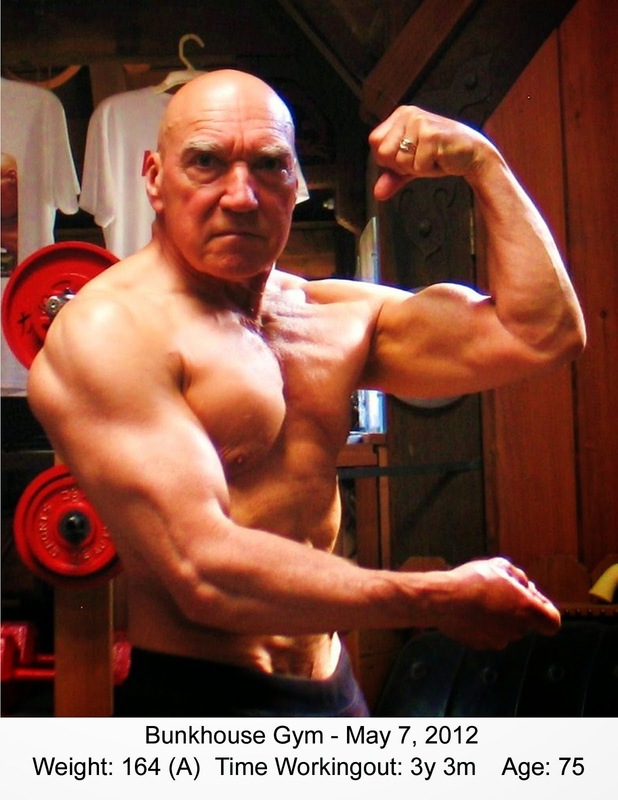 At my age I can never be sure what my body can make on its own, so a little extra muscle building ingredients won’t do any harm, if there is excess it will just get passed through. I also take flax meal, a daily multi-vitamin, an anti-oxidant and a fish oil capsule. It is important to note that at 74 years of age I take no prescription drugs - absolutely none! Out of a possible 312 training days in Year Two I missed 42 days due to injuries, illness, or travel. In the coming years of my marathon if no trips are planned and I suffer no injuries or illness I may have to take some voluntary days off. As I age my body may need a few weeks off from time to time to heal itself properly. My ability to keep the current pace of training could be counterproductive to my overall health if I’m not careful. I will have to monitor and heed my body’s need for rest once in awhile to avoid overtraining. 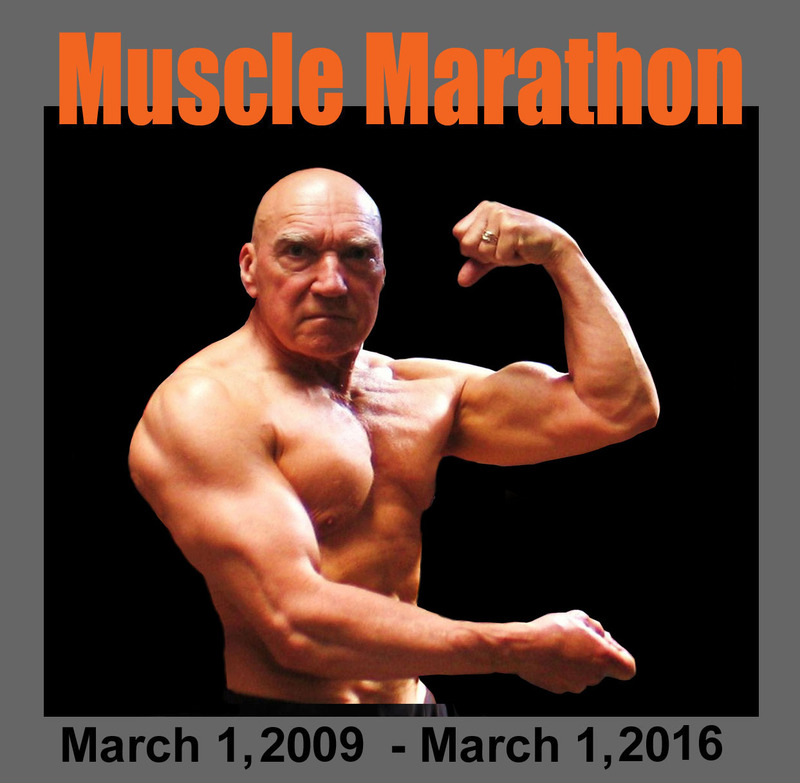 When I started my Muscle Marathon two years ago I took the first step in trying to get my muscle factory operating again. It required a lot of hard work and proper diet but after nineteen months of rehabilitation I could see visual results. (see photos below) After years of neglect, my body’s muscle building machinery was up and running and producing muscle again. Instead of the normal loss of around a pound of muscle a year for a person my age, my muscles are now actually growing. I did have doubts during Year Two about my ability to sustain such a difficult ordeal, particularly when I was injured. But because the rewards are so great I have been able to convince myself to overcome the doubt and pain and push on. Now that Jack Lalanne has passed away there is a need for someone else to carry the “fitness through strength training” torch forward. I hope I can, by example - through my muscle marathon, contribute something to the growing need in this country for physical fitness and good health. 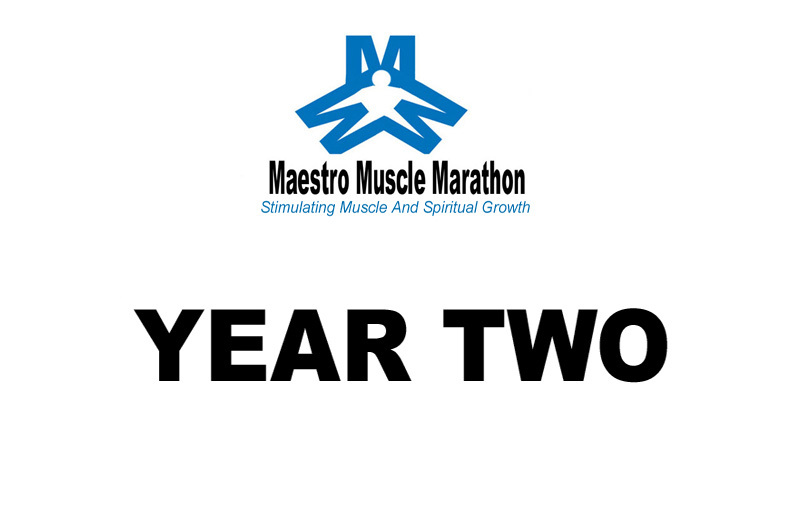 I look forward to year three with renewed faith that I will be able to see the marathon through to the end and in doing so inspire others to begin making the lifestyle changes necessary to improve their overall strength and good health. As we grow old we should strive to be an asset to our country and our children, not a burden. Our rallying cry should be, “A strong mind in a strong body till the day we die!” I believe it is possible for all of us to achieve this goal if we apply ourselves. Check back next year on Marsh 1, 2012 to see how I’m doing after another year of the Maestro Muscle Marathon. 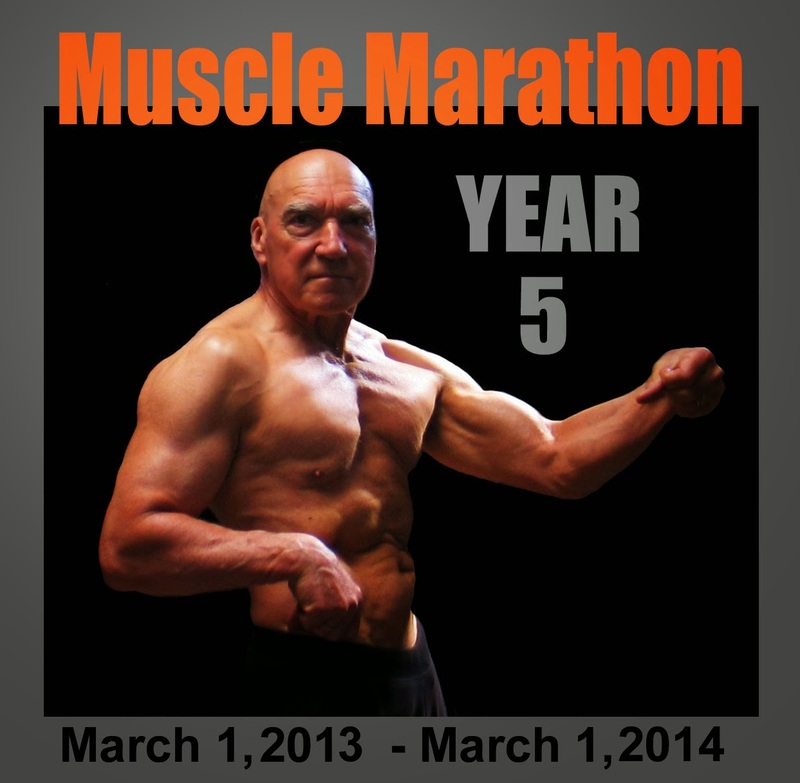 On March 2, 2009 I began a physical training regimen I call, the Maestro Muscle Marathon. It is a creative mind-body physical training program that stimulates muscle and spiritual growth. It is designed to promote good physical and spiritual health after age 50. It is also designed to minimize, and perhaps even prevent, some of the diseases and problems brought on by old age such as Alzheimer’s, diabetes, dementia, and muscle loss. The Muscle Marathon consists of a sustained six-days-a-week weight-training program of twelve upper body exercises and five lower body exercises using barbells and dumbbells. It is a protracted regimen of concentrated lifting exercises that stimulates natural strength and natural muscle growth while encouraging spiritual awareness. In order to complete the marathon these exercises must be done each week for a period of seven years. The dedication needed to complete this seven-year physical ordeal, and the discipline it requires, will stimulate the spirit and promote good physical health. 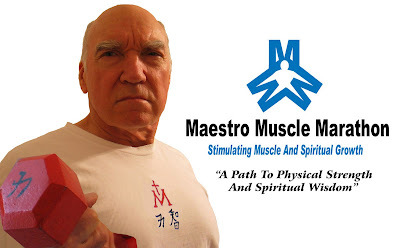 The principles upon which the Maestro Muscle Marathon is based are similar to the physical training programs practiced by Buddhists monks in Asia. It incorporates the physical discipline exemplified by the Marathon Monks of Mount Hiei, and the wisdom and spiritual teachings of marshal artists such as Morihei Ueshiba. The Marathon Monks of Mount Hiei are a Tendei sect of Buddhists monks whose temple is loctated on Mount Hiei near Kyoto, Japan. The Marathon Monks seek enlightenment through physical ordeals, which includes a spectacular feat of physical endurance called Kaihōgyō. The Kaihōgyō is a practice of walking long distances (up to 52 miles) in a single day every day continuously for 100 days. The 100-day marathon is done once a year for a period of seven years - that’s a total distance traveled of over 27,000 miles - a distance equal to the circumference of the globe. The monks who attempt the Kaihōgyō are very few. The majority of the monks stay with the traditional method of spiritual enhancement; prayer, meditation, calligraphy, and general labor within the temple. Only six monks have completed the marathon since WWII. Those few that have managed to finish the seven-year marathon are considered living saints. The Marathon Monks believe that a physical ordeal is the means to spiritual enlightenment. It coincides with the beliefs of other Buddhists monks, such as the Shaolin monks of China and the Shinto monks of Japan, who include marshal arts training as part of their overall spiritual growth. Morihei Ueshiba continued to train until his death at age 85. John Stevens goes on to say, “Even as an old man of eighty, Morihei could disarm any foe, down any number of attackers, and pin an opponent with a single finger.“ The fact that a man in his eighties could still have such physical strength and spiritual awareness is proof that physical training can improve both body and mind continuously even as one ages. I chose to use a gravity opposing weightlifting program as opposed to a martial arts training program because I wanted a physical ordeal I could pursue alone at home in my studio. 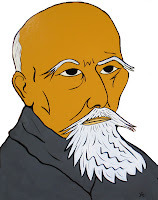 (Morihei Ueshiba walked across his yard to his Dojo each morning) I wanted a training program that was similar to martial arts training in its overall dedication and effort expended without the necessity of joining a Dojo and without the need of a training partner. Furthermore I am familiar with the weightlifting discipline. I was a bodybuilder for ten years and that experience helped me get started without having to learn a new discipline at my advanced age. My first weightlifting experience came in1960. I started training to gain muscle weight because I was skinny. When I was 24 years old I only weighed around 150 lbs. at a height of 5’9. 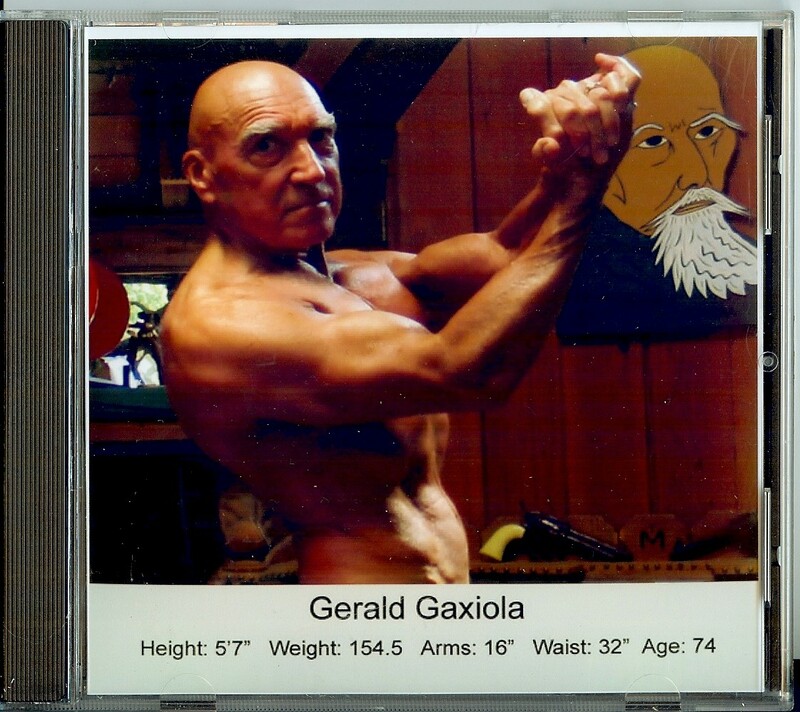 I trained regularly for ten years building up muscle weight, and at one point I weighed a muscular 214 lbs. I also competed in weightlifting and bodybuilding competitions. I continued to body build for ten years. 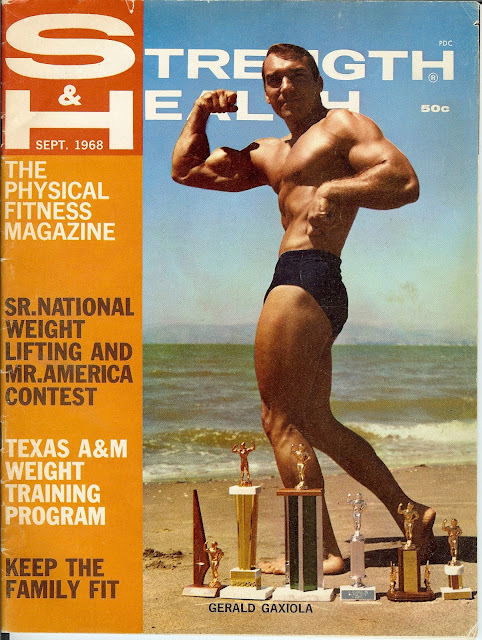 Then, in 1970, at age 34, I stopped weightlifting completely. At that time I weighed 193 lbs. I never touched a weight again for forty years. I did no exercising of any kind. I turned away from the physical, the body, and turned inward toward the mind. 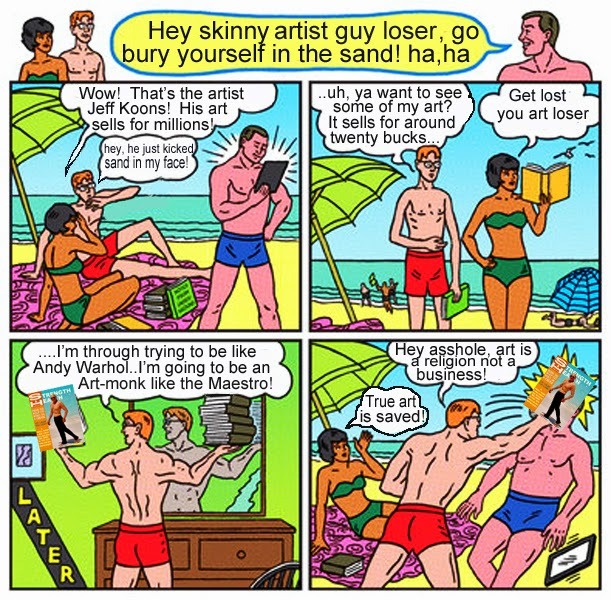 I lived my life as an artist, hanging out in cafés, smoking unfiltered French cigarettes and drinking lots and lots of espresso coffee, paying no attention at all to my physical self or to what the artist’s life was doing to my body and to my health. I ate very little and over a period of about ten years my weight dropped to 155lbs. My body weight stayed below 160 lbs for most of the 1980’s then I started eating more and my weight began to go up in the 1990’s. After I hit 50 my metabolism changed and fat started to accumulate around my midsection. 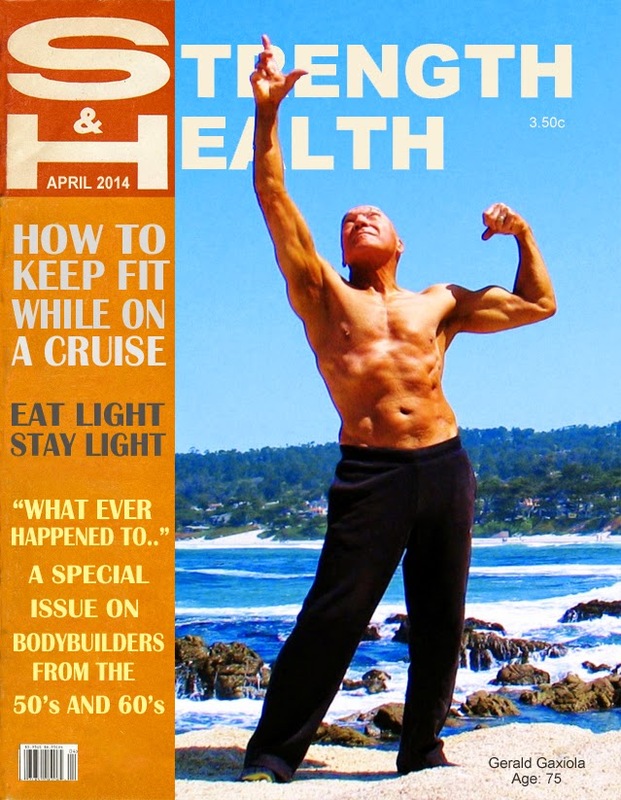 When I turned 65 I weighed around 175 lbs. My belly was bigger, my joints were aching and my knees were weak. I was losing strength little at a time every year as I got older. (Men lose around 20 to 30 percent of their strength each decade after turning 50). While my art spirit was ascending my body was in decline. In the early eighties I had even started to drink wine, beer, and whisky, then, in 2000 I completely stopped drinking alcohol of any kind. I also stopped smoking and drinking espresso coffee, which improved my health, but my weight continued to go up, it went up to 187lbs. I was getting back up to my bodybuilding contest weight - but this time it was not muscle weight, this time it was fat weight. I started to cut down on the amount of food I was eating. In 2006 when I turned 70 my weight was down to around 166 lbs. But it wouldn’t stay down, in 2009 it was up again to 172 lbs. I was physically weaker than ever and my brainpower was on the wane. At 72 years of age I knew time was running out so I decided to get serious about my health. 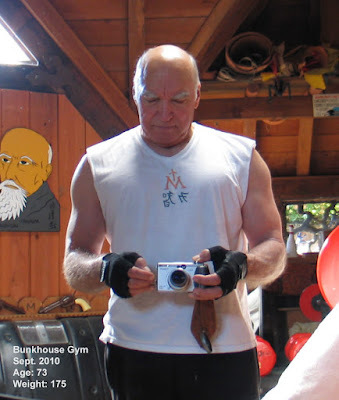 I thought perhaps if I followed the example of Morihei Ueshiba, and the monks of Mount Hiei, I could embark on a similar protracted physical regimen and reap some rewards, both physical and mentally, even at my advanced age. That’s when I devised the weight lifting program I call the Muscle Marathon. Its not weight training for the sake of the ego, it is a physical regimen designed to improve physical health while enhancing spiritual awareness. 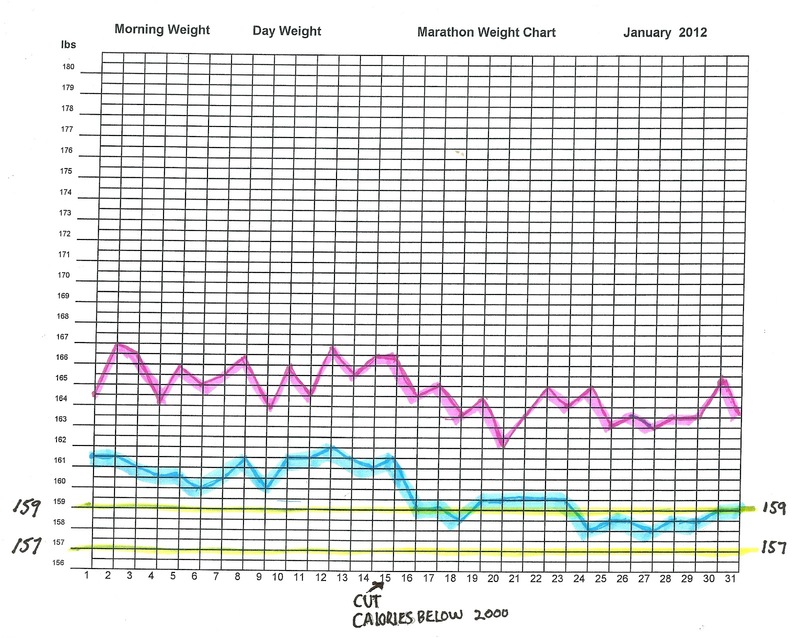 So, with that in mind, in February 2009 I began to prepare for my physical marathon. I’m posting details about how I went about it on this blog in the event anyone else would like to start their own marathon. I got started by buying a workout bench along with about 300lbs of weights. My wife Alice found them on Craig’s List. I supplemented this with some dumbbells I bought from The Sports Authority and Wal-Mart. I found there was no need to buy a lot of expensive equipment; all this cost me was around $300. 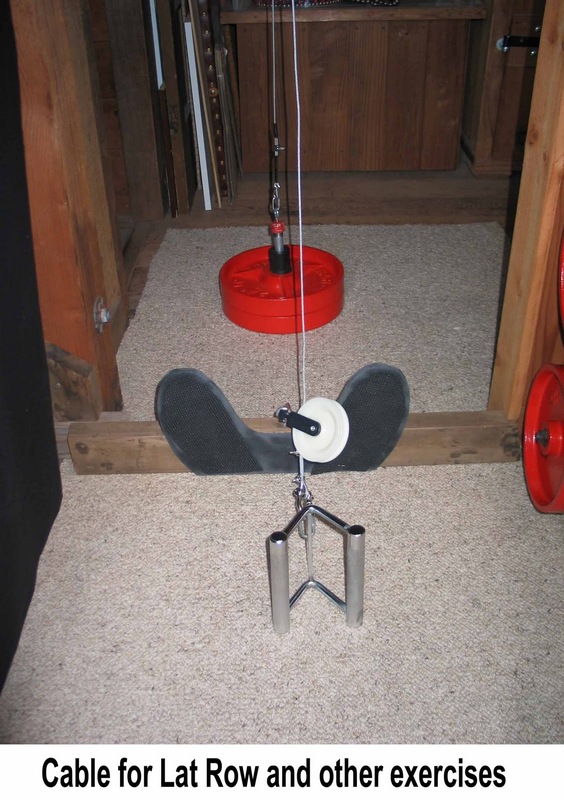 Craig’s List and E-Bay have lots of weightlifting equipment listed. Luckily I found a good solid workout bench with a leg extension/ leg curls attachment to work out my legs. That was an essential piece of equipment. I had heard some fable about weights that are painted any color other than black seem lighter to lift…I don’t know if that is true but being an artist I couldn’t resist painting my weights and equipment to my tastes. I respect my weights and I don‘t throw them around like they were just old pieces of iron, I am gentle with them and treat them like works of art. 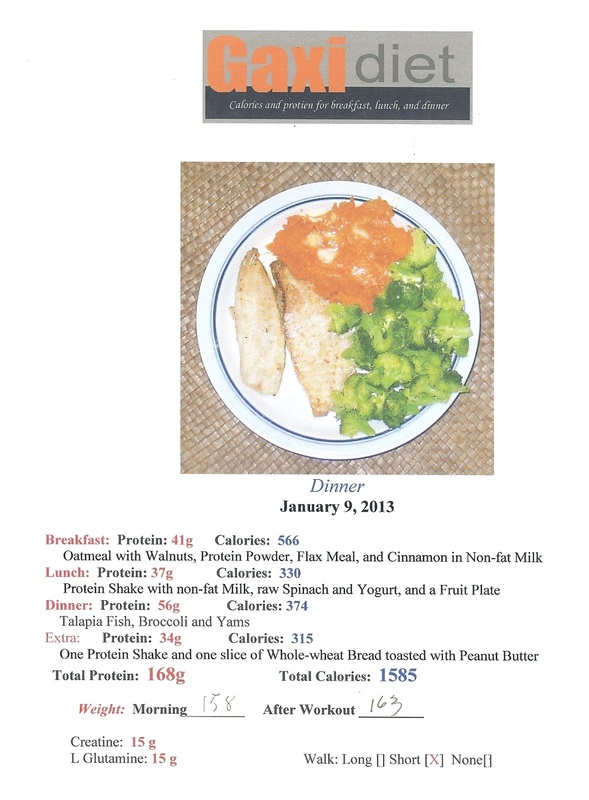 The U.S. Department of Agriculture recommends that men get 56 grams of protein a day. I don’t eat enough food to get that much protein. So that requires I use a supplement in order to get enough protein. I use a whey supplement called whey-isolate that is processed to get the most muscle building protein out of each gram. I take 53 grams a day of this supplement to be sure I have plenty of protein to rebuild the muscles I tear down during my workouts. In order to keep my strength up, as well as for health reasons, I eat a lot of grains, nuts, fresh fruit and vegetables for breakfast and lunch. Dinners vary but I try to eat turkey, which has 41 grams of protein per cup, beans, 15 grams per cup, or meat at about 9 grams per oz. Meat has always been the bodybuilder’s choice for protein. But I’m not convinced that our meat is all that safe to eat anymore so I limit myself to small pieces of roast beef or pork once in awhile for a little variety. Most foods have protein of some kind or another but if you are working out you need bodybuilding protein and most foods don’t have much of it, if any at all. I take photos of most of my meals for reference. It is important as I progress to know what I ate and what the sizes of my portions were so I can regulate my weight. If I gain too much fat weight in a particular year I can look back to see what and how much I had been eating. 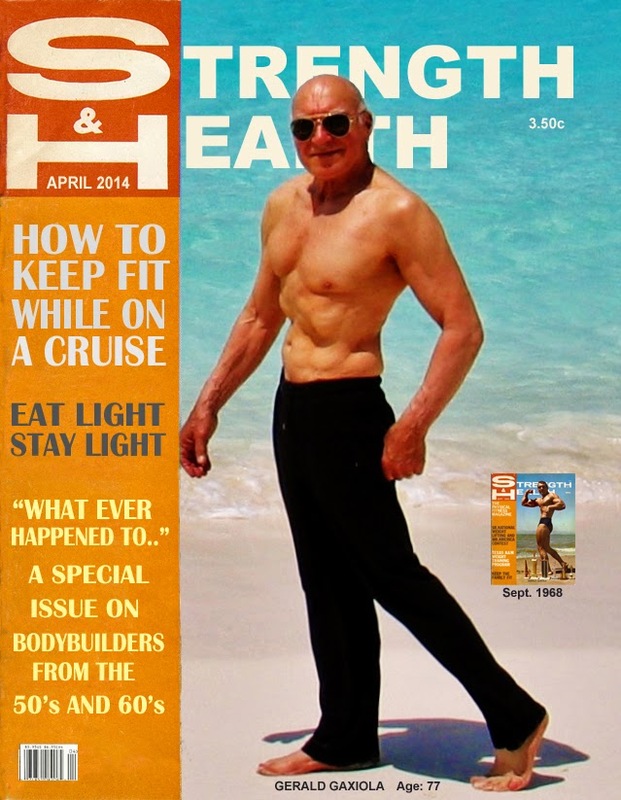 Jack Lalanne has been railing against white sugar for over sixty years. He says its poison. I never paid much attention to him even when I was bodybuilding, but now I have become a true believer. When I started to read the labels on food packages and I saw just how much sugar is added to manufactured food I threw out my candy stash and swore off anything with added sugar. Take a teaspoon and measure out 10 teaspoons of sugar into a glass, that’s how much sugar you are putting into your body every time you have a soda. Even two small squares of dark chocolate contain a teaspoon of sugar. Just one Trader Joe’s Vegan Trail Mix Cookie contains over two teaspoons of sugar! Sugar is hiding out everywhere silently destroying people’s health! If you must have something sweet eat some raisins with walnuts or some other naturally sweetened fruit, pineapple, grapes, apples, things like that. Sugar is you enemy: protein is your friend. These are the lifting exercises for the marathon. These lifts are designed for free weights. Free weights help give your body balance while lifting which is important for older bodies. A lot of weight is not necessary, just enough to work the muscles but not so much as to injure the joints. A slow steady movement on each lift is what you strive for. You should be aware of your muscles as they push or pull on the weights. I started my marathon on March 2, 2009. I will complete my marathon on March 1, 2016. I decided to work only the chest, shoulders, arms, stomach, and legs muscles because those are the main lifting and pulling muscles. Since I am not bodybuilding to gain bulging muscles or to compete in bodybuilding contests there is no need to workout every muscle. I started out with fairly light weights because I wanted my body to get used to the various routines. Once I was familiar with the routines I began to push myself by adding more and more weights with each workout. That was my first mistake. I didn’t realize that my joints were old and worn and that putting extra pressure on them would be painful. Three weeks into my program I strained my elbows so badly doing barbell arm curls that I had to stop working my arms for three weeks. That’s when I realized that I should only use enough weight to make ten reps doable without straining my joints. When I gained enough strength in a particular exercise to where I could do twelve reps I added some weight and went back to ten reps. I continued to ratchet up my weights to where I now have a workout where I am comfortable, just enough weight to make it difficult but not so much that it strains my joints. The main joint trouble is in the elbows, shoulders, wrists and hands. I bought elastic elbow and wrist bands and some workout gloves. They helped but I still have some pain in those areas. One thing I found that really inflamed my hand joints was oranges. I started eating an orange every night and after a couple of weeks I could hardly hold a dumbbell. I stopped eating the oranges and the pain went away in two days. I also ran into another problem in the beginning. A little over a month into my marathon I suddenly came down with a kidney infection. That laid me up in bed for a couple of weeks. The doctor I went to told me it was caused by an infection, but I am not so sure that it wasn’t caused but all the protein I was ingesting. I started out with around 30 grams of whey protein a day but as my workout progressed and my muscles and joints began to ache more and more I increased my protein intake to over 100 grams a day. I thought more protein would heal everything. I was wrong. I will probably never know if my kidney infection was caused by protein overload or not but now I only take 53 grams of protein a day. Since I am now using whey protein isolate I believe that is enough to repair my muscles after each workout. It is important to remember that you don’t gain muscle size and strength while you are working out. Working out is when you tear down your muscles, it is the resting between workouts that heals and strengthens the muscles. Therefore an older body needs plenty of rest and muscle building protein in order to help it build and heal those muscles damaged during workouts. While my body is resting is the time when I reflect, continue my philosophy studies and work on my art. After a year of training I still have some belly fat. I started my marathon weighing in at 173.5 lbs. and I went up to 176 lbs. before I had my kidney infection. I then dropped down to 173 lbs. and stayed there for most of the year. I didn’t want to lose too much weight the first year because weight loss is strength loss. I thought I would start dropping pounds in my second year with a goal of weighing in at a solid 167lbs. at the end of my marathon. I still ate sweets and candy for most of the year thinking I was burning off those extra calories by working out. It wasn’t until I purged myself of sugar in December, nine months after starting my marathon, that I started to lose fat weight off of my belly. At the end of my first year I weighed in at 166.5 lbs.